Latest trends in Pin Up Fashion & Rockabilly Clothing. Rockabilly kids clothes shouldn’t be expensive or hard to find. They should only be stylish! Here are our picks for rockabilly kids clothes for Spring. Dressing your kid in cool clothes shouldn’t be a novelty, it should be a lifestyle! Be the cool parent who never dresses their kids in embarrassing, generic clothes. Rockabilly kids clothes make a statement and are so much fun to dress your little ones in. Your child isn’t like everyone else, so why should they dress like everyone else? Here are some of our favorite rockabilly kid’s clothes for spring. Little boys want to grow up to be just like their dad’s. Let your little one go wild in this rockabilly boy’s work shirt. 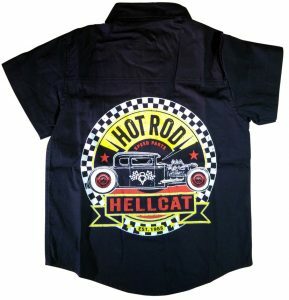 This collared, short sleeve, black button-up features a hotrod design that will make him think he works in a 1950’s garage servicing classic cars just like dad used to do. Onesies are so stylish, even adults want to wear them now! We’re sticking to rockabilly baby onesies and we think they’re pretty stinkin’ awesome. 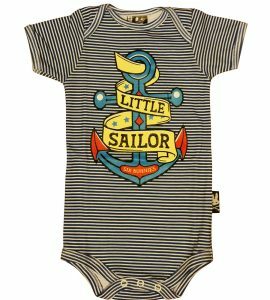 These onesies feature hilarious rockabilly phrases such as a jailbird inspired print that reads: “I’ve been inside for 9 months!” Onesies are also a convenient piece for your baby’s wardrobe since they’re easy to slip on and off for quick diaper changes or mornings on-the-go. Quarter length sleeves are great shirts for little ones during the Spring months. These can be worn on their own on warmer days or paired with a kid’s sweater for some extra warmth. Designs for this rockabilly kid’s shirt include a Mexican inspired skull with hearts for eyes and a big message on his teeth. Little girls should never be left out of rockabilly fashion. Before they are old enough to be considered a pin up girl they start out the way the rest of us did: with rockabilly prints. 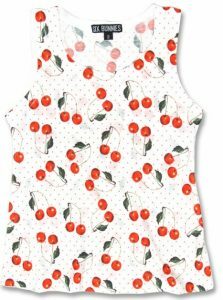 We have a huge selection of rockabilly girls shirts, like the white cherries polka dot tank top. Pair these with cute frilly skirts or little baby leggings for an awesome rockabilly look. 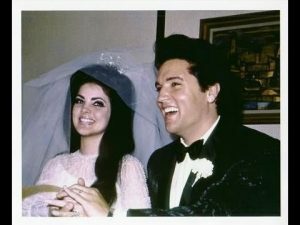 Pioneer of Rockabilly Music Elvis Presley with wife Priscilla. Rockabilly music came a long way and still reigns in the underbelly of rock ‘n roll riffs today. Here are 4 pioneers of Rockabilly Music. Ever wonder who paves the way for Rockabilly clothing and music? These are the legends among legends. We’re looking at the biggest names in rockabilly music. These pioneers led the way for blues and rock and roll music to marry into the sweetest sound you’ve ever heard. Without further ado, here are some rockabilly greats. Can a list for pioneers of rockabilly music exist without mentioning the King of Rock ‘n Roll? Elvis Presley had a humble beginning before rising to the top as the rock ‘n roll revolution began. Famous for having his shaking hips induce hysteria amongst teenage girls, Presley opened the way for black musicians at the time to join the mainstream rockabilly movement. Presley’s talented rockabilly vocals gave way to a new generation of singers who wanted to sing from the heart, dance from the hips, and give their guitars a lick to love. Country and rockabilly had much more in common back in the 1950’s than they do today. Brenda Lee was a pioneer of female rockabilly singers. Before her rise to country radio, Lee created songs like “That’s all you gotta do” which showed off her raw vocals and rockabilly sensibilities. This made an impact on early rock ‘n roll. Brenda Lee was aptly nicknamed “Little Miss Dynamite”. Definitely a fitting title for this rockabilly mistress turned country hall of famer. Perhaps more synonymous these days with Weezer’s aptly named single “Buddy Holly”, this rockabilly legend went from bluegrass music to a rockabilly stud. In 1957 Buddy Holly got his big break with his band The Chirping Crickets after they performed alongside Elvis Presley at a show in Texas. Performing on such programs as the Ed Sullivan show, Buddy Holly shot to the top of the charts with his single “That’ll be the Day” and was an overnight success. Eventually Holly had left his band and began recording solo music. On 1959 Buddy Holly, along with “The Big Bopper” and Ritchie Valens died in a plane crash. Buddy Holly made the most of his time in the short 18 months that he was in the rockabilly spotlight. He was an amazing writer, performer, and pioneer for rockabilly music. Arkansas native Johnny Cash is one of the biggest names in rockabilly music. Determined to make a name for himself, Cash taught himself to play guitar and let his hooks and hits flow out. Sometimes referred to as an Outlaw, Johnny Cash was no stranger to drama in his personal and professional life. This rockabilly legend used to play prisons and sold out shows with his love and fellow singer June Carter. With over 15 million records sold he more than succeeded in his career. Want to learn even more about rockabilly music and rockabilly fashion? Check out our blog every month for different tidbits about the life of a rockabilly lover. Beach Lifehacks for Summer 2017 + RETRO INSPIRED BIKINIS! The Ultimate Girlfriend Gift Guide – Rockabilly Style!